After Maramures, Robert, Whitley, and I took a 6 hour train ride down to Cluj to ultimately meet up with what felt like half of the PCVs. 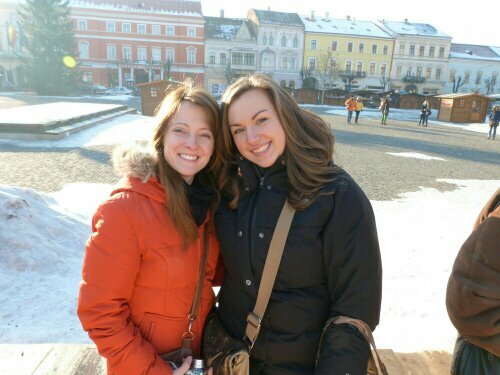 That day we just relaxed and hung out while Megan and Kaitlyn made their way into Cluj. The following day we took Robert and Kaitlyn around the city since it was their first time visiting. We went ice skating, walked around and saw the churches, and headed to the mall. We also met two volunteers serving in Albania that were also staying at the hostel. We all went out together and met up with Kevin, Anthony, and four more pcvs at a bar in Piata Unirii that played nothing bus 50s-80s music which we rocked out to all night long. It was a great new years celebration and so relaxing to speak English with everyone. I also really enjoyed talking to Eric and Garret, the Albania pcvs, about their experiences at their sites and sectors. This NYE marked year 4 that Kaitlyn and I have spent together and we have already started planning next year’s. We are currently in Budapest staying with Kait and I’ll be sure to update about yet another trip to the land of the Magyars.